Introducing the all-new C-280 T-REM MA-08 Blue Wave hydrotherapy tub that relaxes and pampers faster for better health and well-being. Enormous amount of interior space gives a new sense of relaxation. Escape into paradise with this luxury tub. Enjoy the energizing hydro and air bubble massage integrated aromatherapy and lighting effects to balance your body and soul. 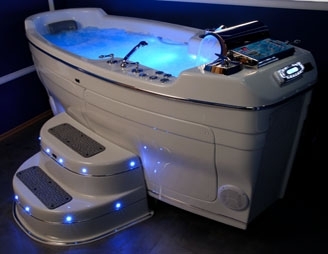 Blue Wave Hydrotherapy Tub offers a luxurious retreat from everyday stress. Its design philosophy combines beauty, craft and functionality. Elegant boat-shaped body and enormous amount of interior space create comfortable environment for anybody, including very tall and plus size people. Blue Wave hydrotherapy tub features 3HP extra quiet motor, creating a dramatic increase in both massage intensity and comfort level. It also generates extra powerful air massage with heated air and stepless intensity adjustment. The perfect compliment to it's royal size is the marine grade quadro sound system with lighted remote control. Blue Wave delivers a spa experience like no other. RMS tubs are oversized, anatomically designed and beautifully finished for highly comfortable hydrotherapy treatments. The interior tub design virtually eliminates body weight, striking the perfect balance between straight line comfort and best functionality.